We study the physical circulation and environmental change in a wide range of time scale, using various isotopic geochemical techniques. Our earth has the atmosphere. When and how the atmosphere has got the current compositions? To answer the question, we analyze He isotopes in mid ocean ridge basalts (MORB). Helium is an inert gas, and does not return to inner earth after degassing from the mantle. Helium has two isotopes, primordial 3He and radiogenic 4He. Thus, analyzing elemental ratio respective to 3He, we can estimate degassing models from the mantle. 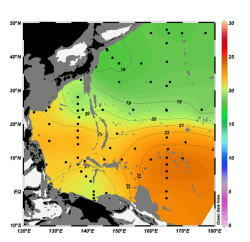 He isotopic tracer can be used not only for understanding atmospheric evolution but also for studying deep seawater circulation. This is because He is characterized by, again, an inert gas, an extremely different isotopic compositions between inner earth and the atmosphere, and undiffusive property in aqueous phase. Our group member joins research crouise, such as Hakuho-maru and Tansei-maru, for monitoring seawater chemistry and sampling sea sediments. 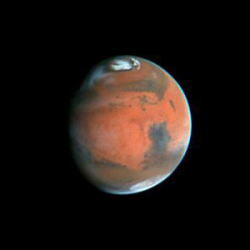 When the Mars has lost liquid water? Our research group studies Hydrogen isotopes in apatite in Mars meteorite. Hidrogen is a constituent element of water, and its isotopic ratio is a potential archive for understanding water amount on Mars in the past. To understand the mineral formation ages, we also study Uranium-Lead dating within a single grain size of minerals. Calcareous hard structures produced by corals, foraminifera and bivalves are highly potential archive recording paleo ocean environment. 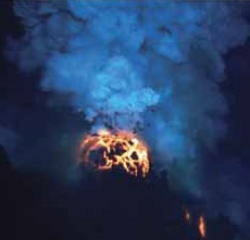 This is because the carbonate ions and metals constituting fossil calcium carbonate are originated from paleo seawater. 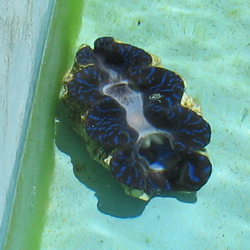 High resolution elemental analyses using Nano-SIMS can provide daily-scale environmental change recorded in giant clam shells.